B U B B L E G A R M: Simple outfit & make up look! Simple outfit & make up look! This outfit is perfect for a nice spring/summer casual evening. I am wearing skinny jeans with a plain baggy top. Remember to clench your waist in with a belt - I have opted for a thin one, this is to avoid looking like I'm pregnant. Wear a clutch to dress up the look. Try to wear statement earrings or necklace to give the outfit a focus point. Skip this step if you are wearing bright prints - opt for plain jewellery instead. TIP: Lighter coloured earrings work really well with brunettes as they stand out more, If you are blonde.. then darker coloured earrings such as black would look amazing. Excuse my messy hair, I washed it last night and slept on it, this was the wild outcome :) I couldn't be bothered, simple! On the face I have: Bobbi Brown tinted moisturiser. Benefit Boing concealer. On the cheeks I have: Nars Laguna on cheeks, Body shop matt blusher. On the lips I have: Body Shop yes yes yes tentalising lip butter and mac oak lipliner to line lips. The eye's took no more than a few mintues, applying with the fingers made it super quick! Beautiful, simple look. I love it. What a beautiful outfit! I love white, it looks amazing next to your dark skin and the sandals are fab, I have to wear flats as broke my toe a couple of years ago wearing uber high shoes and it's set so it can't bend, niice! And I agree with LottieB, women who cannot appreciate another womans beauty and success is NOT a sister! You're fabulous, bugger em! First of all don't worry about haters!!!!!! second of all.. OMG.. YOUR FASHION STYLE IS EXACTLY WHAT I LIKE!!!!! You always look great! 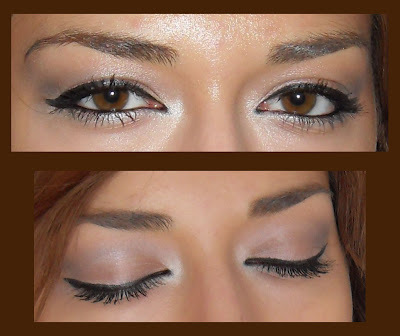 Simple perfect day look! oooooooh pretty! :) and as always.. LOVE the clutch!! do you know where i can get the thin leather thingy that you use as a belt?? You look amazing! !I like your style so much! !Where do you usually get your clothes from? Where is the belt and white top from?? I love the look!! I know your turkish.. im off to Istanbul for my dad's work trip and this is the kind of outfit I want to wear on the plane ride there! I don't know why you can't comment.. hmm.. I'll take a look into it..
oh.. and honestly..if I didn't know you and came across your picture, I would think you were a model!!!!!! could you try again please.. ? WOW I love the outfit, you can tell you have a degree in fashion! have a nice evening and sleep dreams!! Love Love Love it!!! I am searching for an exact replica in my closet tonight..hahaha! ugh i loved the outfit!!! you did an amazing job with your eye make-up - perfection!! Thats a beautiful outfit!! Where did you get that shirt? Im obsessed with it! !